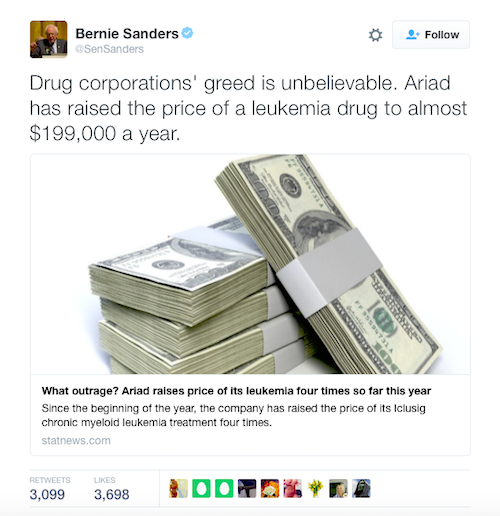 With a single tweet, Senator Bernie Sanders has cost Ariad Pharmaceuticals $387 million. The article retweeted by Sanders was from a publication that specializes in covering health and medical news. It reported that, since the beginning of the year, Ariad has raised the price of its Iclusig chronic myeloid leukemia treatment by 27 percent. The drug now has a pre-rebate list price of $16,560 a month, or almost $199,000 a year. Even worse for Ariad’s image (to say nothing of consumers), this isn’t the first time they raised the price on that drug, having done so twice last year.